The 2017 meetings were a huge success. Over 1600 people registered for the various meetings which is a record and we expect bigger things for 2018. Watch this space for developments or for automatic meeting updates by email register via the box on right hand sidebar or follow us on Facebook. Queenstown Research Week is New Zealand’s biggest annual scientific gathering. It is a week of co-ordinated meetings covering a wide range of science areas. 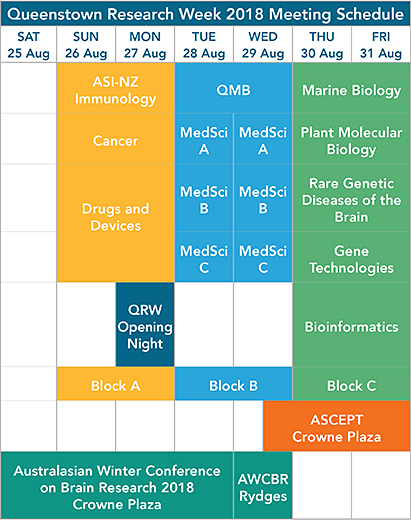 The concept has developed from three different iconic New Zealand scientific meetings: the NZ Medical Sciences Congress (MedSci – incorporating the annual meetings of the NZ Society of Endocrinology and Physiological Society of NZ), Queenstown Molecular Biology Meetings, and the Australasian Winter Conference on Brain Research. These meetings agreed to co-ordinate their meeting programmes in order to create critical mass, and QRW is pleased to host these and a range of other important meetings each year. In addition to the meetings, there is a varied social programme to increase opportunity for networking.